I get uncontrollably overexcited about certain things. It is a curious and well-known (among my friends and family) phenomenon. Cheese, for example, throws me into a frenzy of knowledgeable excitement which leaves me rambling for minutes on end, saying things like "of course, there is the Cashel Blue, which really is one of the better soft blue cheeses, unless you're counting... Hello? Hello?" and realising that I've been left alone at the cheese counter in Asda for quite some time, and that other customers are beginning to stare. In addition, anything involving dinosaurs or robots leaves me a gibbering, giggling, geekified wreck. Pictures of small cute animals, preferably stuffing their tiny faces with food, sends me into paroxysms of delight. Nothing, however, comes close to the sheer adrenaline rush and immediate emotional meltdown I experience whenever Other Half mentions the key word "present". It is like she has just plugged me into a socket. My brain reacts with lightning speed, screaming in exultant joy as it throws its doors open to the wonderful world of possibilities. So you can imagine the dizzying heights of emotional turbulence I reached today when I received the following email. I've bought you a little present. *twitches frantically* What is it? WHAT IS IT? It's just a little present. Don't get too excited. What could it be? My mind races through all sorts of wonderful, dream-like scenarios in which Other Half hands me the keys to a motorbike (this will never happen because I can't walk in a straight line for ten paces without crashing into something and no one has ever allowed me to have a driving lesson for this reason), or a pygmy goat (pygmy anything, really) or Laura Dern, wearing her Jurassic Park outfit complete with hat. Once I've discarded these theories, on the basis that they all defy logic and what I know of Other Half - she prefers me alive (as opposed to roadkill) and not sleeping with Laura Dern, and she refuses to let me have a housegoat for reasons known only to herself - the possibilities that are left number in the millions. It could be a cd. It could be some kind of nice soap. It could be a sweater. It could be a ruler with some cute pictures on it. It could be anything. My mind reeled. I was unable to handle the ocean of ideas. I floated around in it, dazed but happy. The only thing I was certain of is that time was not going by fast enough, and that I really, really wanted my present. By the time Other Half got home, I had been sitting at the bottom of the stairs for an indeterminate amount of time, anxiously awaiting her arrival. Roland and Giles, as they normally do, ran to greet her with yips. They twined lovingly around her legs, making her stumble as she tried to walk without treading on ground that suddenly seemed to be made entirely of delicate cat limbs. Other Half: (looking at me with amusement) Here you go. It's rubbish so I don't know why you got so excited. Me: (in awe) It''s the single greatest thing I've ever seen. 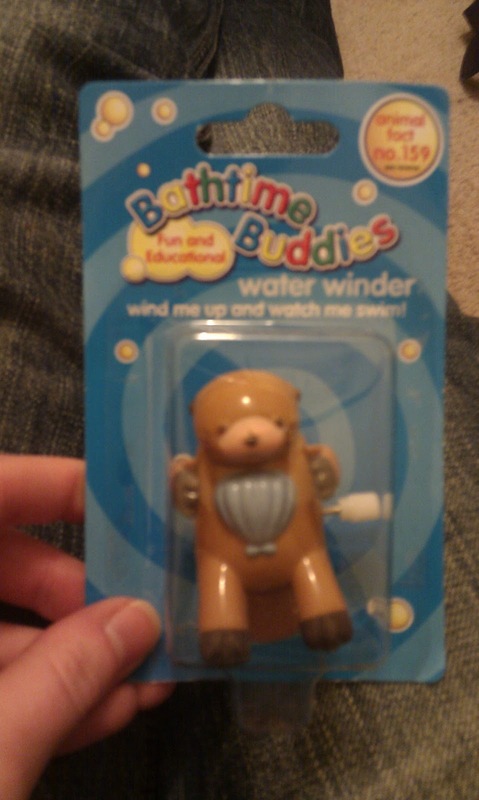 It was a wind-up otter bath toy. Other Half knows how much I love otters and everything otter-related. I constantly make otter puns ("that's otterly brilliant" ...*cymbal crash*) and whenever the mood strikes me I will happily sing along to my ipod, inserting the word 'otter' into songs, completely at random and with total disregard for the lyrical flow. Think how much better songs would be if artists wrote them about otters. For example, that Elvis classic You Were Otter On My Mind, or, Whitney Houston's I Will Otter Love You. This puts me in mind of the Muff Game, which, despite sounding like an awful euphemism, is not a drinking game as such, just a game I tend to find funnier when I'm drunk. There is only one rule and it is simple - you choose a song with the word 'love' in the title, and replace it with 'muff', so you'd get song titles like All You Need Is Muff, and How Deep Is Your Muff, and When A Man Muffs A Woman. Best suggestions on a postcard, or in the comments section. YES! Muff Shack in particular was beautiful. I see your entries and I raise you 'Muff Me Tender' and 'Burning Muff' and 'To Sir, With Muff'. God, I love this game. OMG this could go on for a long time - superb!